Mining and metals investors were offloading the sector's big names on Friday after sharp declines in iron ore and base metals prices which according to some market observers have been running ahead of fundamentals. While gold was trading at near 12-month highs on the back of safe haven buying, copper fell more than 3% to $3.03 a pound or $6,706 a tonne, bringing the bellwether metal's impressive two-month rally to a screeching halt. For the week, lead was hardest hit among base metals, dropping 4% to $2,311 a tonne, while zinc gave up more than 3% exchanging hands for $3,094 on Friday. 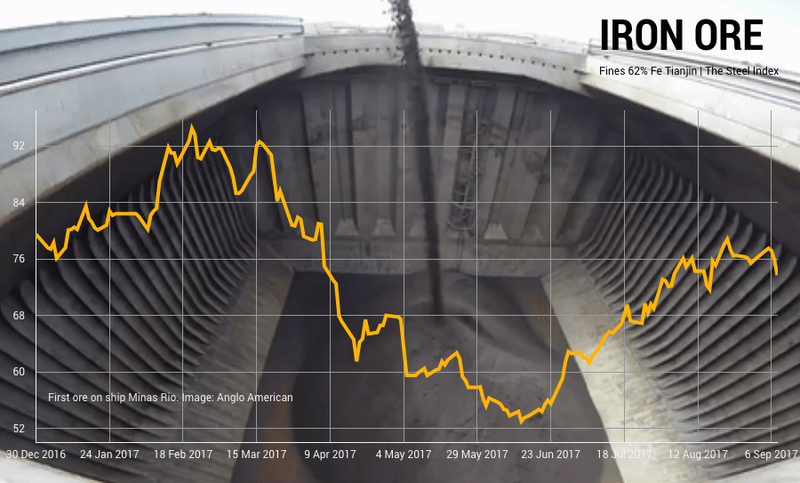 The iron ore price which has been also been defying expectations turned lower on Friday with benchmark Northern China import prices declining nearly 3% to $73.70 a tonne, a three week low. 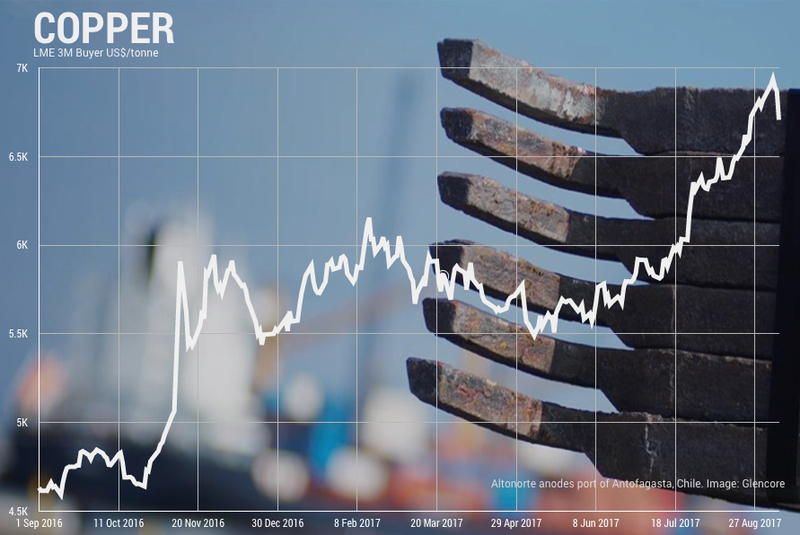 Coking coal was also softer on Friday, but at $209.40 a tonne premium Australian exports are up nearly 40% from its 2017 lows struck in June. The bearishness spilled over to the sector heavyweights with investors rushing for the exits and booking gains on stocks that have enjoyed huge run-ups since the summer doldrums. Shares in world number one miner BHP Billiton (NYSE:BHP) lost 3.2% in New York while Vale (NYSE:VALE.P), the world's top iron ore and nickel producer, fell 4.2%. While BHP is looking to shed assets, Rio de Janeiro-based Vale is said to be targeting acquisitions in an effort to diversify its portfolio. The world's second largest miner based on revenue Rio Tinto (NYSE:RIO) declined 2.9% in New York. The Melbourne-HQed company is the world's number two iron ore producer and number seven copper producer, but unlike BHP and Vale which upped iron ore production by more than 5% during the second quarter experienced declining output of the steelmaking raw material. Anglo American (LON:AAL) gave up 3.1% in New York, but year to date gains for the world's fourth largest diversified miner are still near 30%. Top listed copper producer Freeport-McMoRan (NYSE:FCX) plunged 6.5% and with Vale was among the NYSE's top 10 most actively traded stocks on Friday. The Phoenix-based company announced last week that it's negotiating a deal with the Indonesian government to give up a majority stake in its iconic Grasberg mine in the remote Papua province of the Asian nation. Glencore (LON:GLEN) was also marked down, with its over the counter units trading in the US losing 1%. Glencore is the world's third largest copper company in terms of output with production of 1.3m tonnes last year, but with little exposure to iron ore other than through its trading arm escaped some of the damage. Glencore is also benefitting from being a major producer and top trader of coal. World number five copper producer Southern Copper (NYSE:SCCO) took a 3.6% hit while Canada's largest diversified miner, Teck Resources (NYSE:TECK) lost 5.5% in New York. Teck's valuation took a drubbing this week after it was revealed that a Chinese sovereign wealth company slashed its 17% stake in the Vancouver-based company first acquired in 2009.